I have been staying in this La Quinta Inn in Colorado Springs and one evening I heard a Great Horned Owl calling. I spotted it on the tower of the motel. When I told the desk clerk Monica she said that there had been a pair of these owls that had frequented the motel for several years. 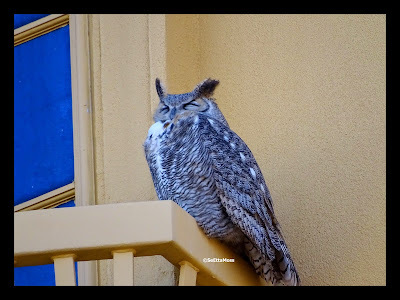 The next day the one Great Horned Owl perched on the faux balcony of the tower all day long. Then near dusk a second owl was there, clearly a mated pair. The pair perched near each other until dark then hooted for awhile before flying off to hunt.